(Fort Myers, FL, November 4, 2011) Air Science, LLC, Ft. Myers, FL has announced the results of preliminary fire tests of the Purair Advanced™ series of ductless fume hoods. According to Air Science president Paul Chambre, in independent testing the Purair Advanced ductless fume hood successfully survived a series of three controlled burns fueled by acetone without structural failure of the hood . 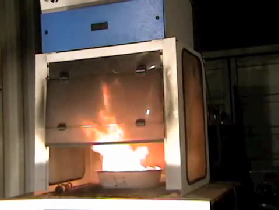 Chambre said "The success of this test is primarily due to the all-metal construction of the Purair Advanced cabinet, versus partial metal structures which may fail when plastic components soften; in some situations polypropylene hoods may actually catch fire." Chambre added that some bonded carbon filters use a solvent-based substrate which may ignite. Purair Multiplex™ carbon filter will not burn. Conversely, the evidence suggests that in a severe fire the Air Science Multiplex filter may aid in fire suppression. "In 2009 a K-12 school in Arizona reported an accidental fire while performing an experiment in an Air Science ductless fume hood. As the fire intensified, the carbon filter split open and extinguished the flames." Chambre emphasized that the Purair Advanced fume hood is not rated for fire containment or suppression. In the event of an accident, however, the Purair Advanced fume hood has shown a remarkable ability to endure a work surface fire without failure. Today, Air Science offers a fire suppression system as an available option to increase the safety of any Air Science fume hood. For information and independent test results on the Air Science Purair Advanced Ductless Fume Hood visit https://www.airscience.com or contact the company toll-free USA, 800-306-0656. Air Science is an worldwide industry leader in the development of ductless fume hoods and other carbon and particulate filtered enclosures used in general laboratory, forensic and industrial applications.